The “memeification” of political discourse in the 2018 Mexican presidential elections. “Okay, let’s start the memes,” posted a member of a community Facebook page in the town of Playa del Carmen, shortly after the first presidential debate concluded. Within minutes, the comments section of the post filled with hilarious, insulting, insightful, and downright offensive memes making fun of the five (currently four) presidential candidates. There was no detailed discussion of the debate, the candidates’ agendas, or the social problems that currently plague Mexico. Instead, the memes—and accompanying “likes”—registered support and disdain in what has proven to be an extremely divisive election. This post, and the thousands of others posted over the course of this campaign season, is a reaction to the narrowing of the channels of representation and grievance for those who are marginalized and feel excluded both in Playa and across Mexico. Here, along Mexico’s Caribbean coast, where I am currently conducting fieldwork on the region’s labor union politics, election discussion is especially fierce. Rather than occurring in public squares, or even among neighbors on the street, these discussions are happening online, in spaces like community Facebook pages. I have followed the conversations taking place on the community’s largest group. Boasting a membership of over one hundred thousand (about half the city’s population), the group is a conduit for residents of the Playa community to share local news, find housing, look for jobs, make new friends, and, most recently, share political opinion. In the midst of such a polarizing election, whose policy implications could be momentous for Mexico, it is surprising how rarely people post about policy issues or the candidates’ political agendas. Instead, posts “troll,” or lure group members into political discussion with inflammatory articles, insulting memes, or “revelatory” videos that expose the corruption, hypocrisy, or ineptitude of a candidate. Those who “take the bait” are pulled into a discussion where they are forced to defend their preferred candidate, insult the opposition, and then make their own post in an attempt to troll the other side. Posts like this can happen three or four times an hour. 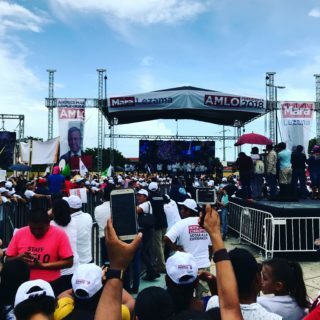 In one recent post, a member shared an article alleging that leftist candidate Andrés Manuel López Obrador’s (AMLO) support mostly came from uneducated voters—a point meant to play up the charge that AMLO is a populist like Chavez and that his supporters are part of the “deplorable” class of Mexicans easily susceptible to the candidate’s false promises. Hundreds of “AMLOvers” responded with their job and education level—and the popular hashtag #AMLO2018—proving Obrador has support among the educated classes and that the original post was fake news. At this level of political discussion, memes are the dominant way of communicating. The meme usually features a photo and lines of text that ask a rhetorical question, point out a contradiction, or reveal a flaw in the candidate’s supporters. The funnier and meaner the meme the more popular it is. Creators across the electoral divide push the envelope around civility. Many lament this trend as the decline of the public sphere and the death of rational discussion, believing this change to signal the rise of populism in Mexico. Even sincere posts are met with trolling, convincing some that Mexico’s fragile democracy is in danger and that polarization now trumps decency. This concern is especially acute for a community Facebook page since members sometimes know one another, especially older Playa residents who moved to the town before the population boom. One such friend was recently expelled from the Facebook community group (though later let back in) because of his anti-AMLO views, a situation that led him to express frustration over what he feels is Mexico’s most divisive presidential election. On July 1, 2018, Mexicans head to the polls to cast their votes in federal and state elections. This year’s race is proving to be especially momentous as the candidate for the leftist National Regeneration Movement (MORENA), Obrador, leads the rest of the pack by an astounding 25 points. The election is also momentous because, according to the National Election Institute (INE), it will be the largest in Mexican history both in terms of the size of the electorate and the number of positions open at the federal, state, and municipal level. With the ritual of electoral democracy now firmly planted in online spaces, more ethnographers should take social media seriously. The campaign season officially began on March 30, but Mexico’s major political parties and leading political figures started mobilizing their supporters into action a year ago. In addition to Obrador, three other political candidates are officially running for president: Ricardo Anaya, the right of center candidate who was head of the National Action Party (PAN) but is running as a coalition candidate after PAN and the Party of the Democratic Revolution (PRD) struck an alliance; Jose Antonio Meade of the Institutionalized Revolutionary Party (PRI); and independent candidate and former governor of the state of Nuevo Leon Jaime Rodriguez “El Bronco” Calderon (former First Lady Margarita Zavala dropped out of the race). In 2000, then PAN Presidential nominee, Vincente Fox, won the presidency and ended the 80-year dominance of the PRI in federal elections. The defeat of the PRI represented an important turning point in Mexico, signaling the emergence of what political scientists labeled as competitive, multiparty democracy in Mexico. Yet, despite the presence of more “choice,” the intervening 18 years in which PAN (2000–2012), and then PRI (2012–2018) held the presidency, Mexicans have grown deeply cynical about the possibilities for change offered by either party. This is not surprising. Mexico’s economic performance has been mediocre at best, while inequality has grown, and corruption and scandal appear routine at all levels of government. Furthermore, a horrific surge in violence, caused by infighting between criminal organizations, has marked the last two decades. The government’s militarization of the conflict has exacerbated the violence and led to millions being displaced, hundreds of thousands being killed, and thousands of others being disappeared. This dissatisfaction with the status quo and the usual political players is believed to be the source of support for Obrador and MORENA. The potential for a leftist win has shocked the rival political parties into attacking Obrador, a move that confirms among his followers the potential change Obrador represents. In Playa, a town dominated by tourism, this dissatisfaction is articulated as a feeling that the hundreds of thousands who make their living here will not see the benefits of the region’s booming economy. As the peso drops in value and the cost of living increases, economic frustrations find resonance in Obrador’s indictment of the corrupt ruling class. 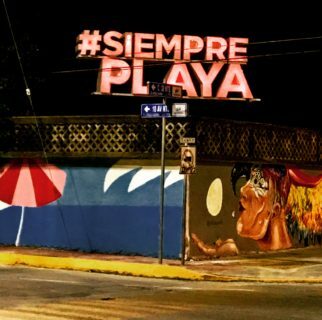 Yet, unlike in other states where such frustrations have spilled over into protest and even violence, Playa remains relatively calm with the most intense political arguments happening online. In part, this is a result of how political and social space is organized in a town dependent on the steady flow of tourists. 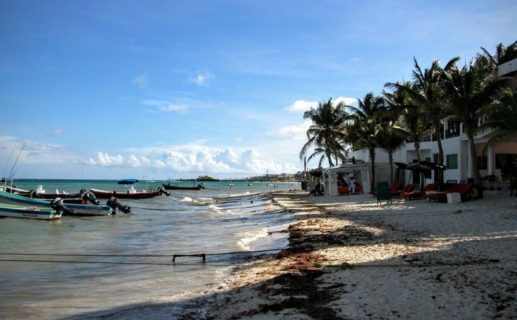 Playa advertises itself as a smaller and more tranquil alternative to Cancun—outward expressions of social and political conflict are bad for business. This pushes frustrations below the surface, but in the presence of the community Facebook page, and an election in which the leading candidate is demanding an end to corruption and support for the average worker, online forums have become a popular place for the city’s marginalized to express themselves. The shift to social media is also a general feature in the national news, as anchors and pundits defer to tweets and Facebook posts to narrate the election. Such trends align with similar changes across the globe in which social media is viewed as a barometer for public sentiment, the means by which politicians and state institutions communicate to the wider public (see Adunbi 2017), and where public debate increasingly takes place, particularly by communities marginalized from the traditional media spheres (Bonilla and Rosa 2015). While some Playa residents remained concerned about the increasing frequency of online trolling and political divisiveness, I prefer to read this online behavior differently. To me, it suggests that there are multiple dimensions to social media participation, particularly in politics, in which moments of coalescence are simultaneously moments of divisiveness and disaggregation. A post featuring a meme insulting Anaya supporters and tagged with the hashtag #AMLO2018 is a signal of one’s political identity in an election that has been evacuated of policy substance. This parallels insights by anthropologists who note how democracy is increasingly a choice between different “brands” (Comaroff and Comaroff 2012), giving the figureheads of political parties a kind of totemic quality often divorced from a well-defined agenda. After 18 years of PRI and PAN rule, a significant share of the Mexican electorate is frustrated and done with talking. Trolling continues because it’s fun and funny; it’s meant less to engage the other side than it is to rally support among like-minded people—a refusal (Simpson 2014) to engage decently. Meme culture provides a language all sides can use without having to get swept up in the technocratic details of governance. Its use of image and its comedic tone permit posters to communicate solidarity and snark simultaneously. This is not to take away from the anger, frustration, and animosity experienced by those who find themselves receiving and throwing insults online—those affective dimensions of this new form of sociality are important to recognize and consider. But with the ritual of electoral democracy now firmly planted in online spaces, more ethnographers should take social media seriously, paying attention to the ways people across the world utilize these channels to creatively intervene in the political arena. As the campaign season enters the final stretch, there are certainly opportunities for surprises. Yet as supporters from all sides dig in their heels and ramp up their trolling, the race, as one Facebook commenter recently posted, already seems decided. Brandon Hunter-Pazzara is a doctoral candidate in the Department of Cultural Anthropology at Princeton University. His research examines the growth of organized labor in Mexico’s tourism zones, broadly exploring what this means for life and labor in the Maya Riviera.